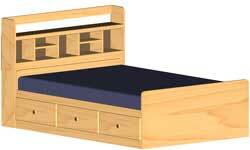 Plan #04-209 (Double Bookcase Headboard Plan) Combo Price Available! The bed...Due to numerous requests, we decided to offer this full-sized version of our mate�s bed plan #03-202. For those lucky enough to have large bedroom space, you can even build the storage drawers on both sides of the bed (his & hers). To complement this bed, you may want to build the matching bookcase headboard plan #04-209. This bed will accommodate a double mattress in the range of 56" by 80" (see mattress chart below). Note that extra space is allotted for bedding. The headboard...To complement our Mate�s double bed plan #04-208, we added this handy bookcase headboard. It is the perfect solution for adding extra storage/display area without using much space. Made of mostly wood veneer, this simple project uses biscuit joinery. This headboard is free standing but can be fixed to the wall or bed if desired. It can also be used with most standard double beds.